We realized this week that we have an extraordinary inventory of Norton wines and decided it was time to start drinking some. We have been told that Norton wines age particularly well in the bottle so once in a while we will pull a random bottle and evaluate it. This week we drew the Hinnant Family Vineyard's 2004 Norton. This North Carolina winery is primarily known for its muscadine vineyard, but they branched out to Norton earlier in the decade. The 2004 vintage still retains the characteristically dark, dark crimson color and a grapey nose. But that's where any similarity ends. The grapey flavor has disappeared and is replaced with a blackberry\dark cherry flavor and an interesting spicy finish. The finish is long with the spicy flavor retained on the tongue. It reminds us more of a Syrah than a Norton. The thesis has its first confirmation: the Hinnant Family Vineyard's 2004 Norton ages well in the bottle. After a day playing at Sesame Place, it was time for the adults to have some fun, so we ventured only a few mile north to visit Rose Bank Winery. 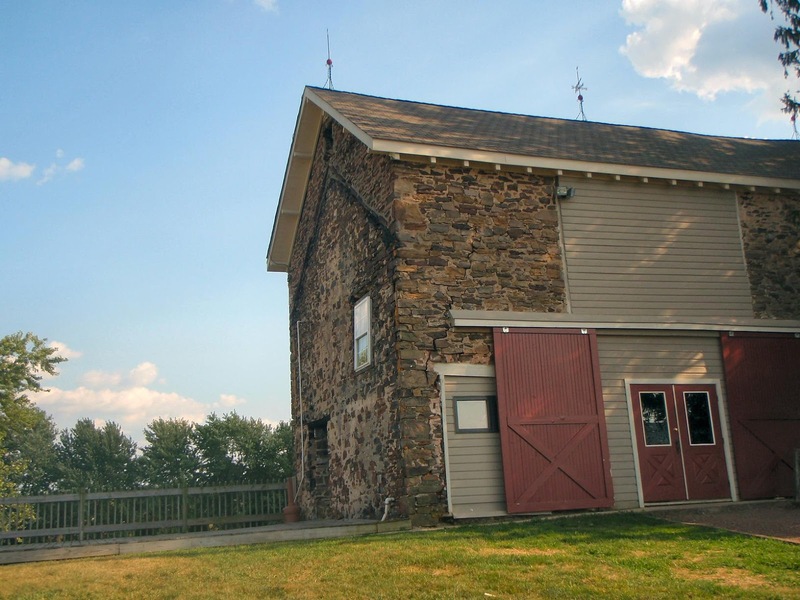 A member of the Bucks County Wine Trail, the winery first opened in 1984 as In & Out Winery. Mike Selesnick owned and operated this venture until 1999, when he decided to retire to Florida. Dave Fleming, a neighboring produce grower, had been thinking about branching out into vineyards, so he purchased the property. This action probably saved the historic farm from development and Fleming renamed the farm after the original William Penn land grant: Rose Bank Farm. In fact, the property resides on a parcel of land originally deeded by William Penn to his daughters. The manor house was built in 1719 and is one of only 25 dressed stone buildings constructed in Bucks County. 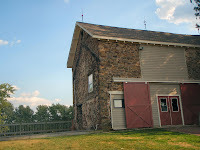 The existing barn was built in 1835, although Fleming lost half the barn in a fire a few years ago. When Dave Fleming purchased the winery, he had zero experience growing grapes and wasn't even a wine drinker. Mike Selesnick worked with him for a year, while he learned all aspects of running a winery and vineyard, then remained as a consultant even after relocating to Florida. Mr. Fleming also earned a degree in Enology from U.C. Davis from a correspondence course. 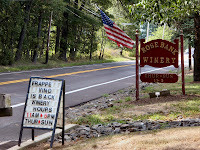 Since taking over, the product offerings and quality have increased and Rose Bank Winery was awarded their first Gold medal in the 2008 Keystone Wine Competition for their Mulled Apple wine. The winery and vineyard also follow organic practices, where manure is used for fertilization and nets cover the vineyard. The tasting facility is located in a new building which also holds both the wine making and fermenting tanks. 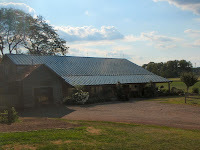 The winery also hosts weddings inside the tasting room or in the historic barn, depending on the size of the party. During our visit there were over a dozen wines available to sample. To satisfy their market, most of the wines are made semi-sweet or fruit wines, but we started with a few of their dry reds. The De Chaunac is a light bodied wine whereas the Chancellor Royale was fuller with an oakier finish. Both were good, but our favorite was the upcoming 2006 Cabernet Sauvignon. This is a full bodied wine - with some oak - and a flavorful, smooth finish. We really liked their white wines, particularly the Vidal Blanc - the 100% varietal and the Nouvelle. Both are made from estate grown grapes and made semi-dry, the difference is that the grapes in the Nouvelle are pressed almost full cluster - just the stems are removed. We left with a bottle of each of these wines. We also liked their Cayuga - it has perhaps the most flavorful that we had previously sampled. The final white was the sweet Niagara - we loved the wine's aroma - a good representation of the grape. The same holds for their Concord, the best part being that its sweet - but not overly so. Rose Bank offers several fruit wines, besides the aforementioned Mulled Apple. This wine suits as more for winter, but apparently others prefer it year round. The Cranberry was our favorite - but may not be for everyone because of its tartness. The others were fruitier and there's a fruit for everyone: Blueberry, Blackberry Strawberry, Peach, and Red Raspberry. We enjoyed our visit and hope to return in the Fall to spend more time at the winery and to explore the Bucks County Wine Trail. The area provides examples of both American history and excellent produce. We wanted to send out a note of support for the citizens of the Republic of Georgia facing a brutal invasion from Russia. This small country is considered by historians as the birthplace of wine cultivation and is home to several indigenous grapes: Rkatsiteli, Akhasheni, Kindzmarauli, Tsinandali, Teliani, and Saperavi - among others. The Gori disrict, which is taking the brunt of the Russian attack, is a large grape growing region and we can only hope that the vineyards survive the conflict. If you would like to learn more about the great wine making tradition in Georgia visit the Georgian Wine House and Dozortsev and Sons. If you would like to donate to Georgian Humanitarian Relief visit WorldVision. Wine & Food Magazine - Wine Snobs? In the September issue of Wine & Food Magazine, Lettie Teague contributed an interesting article on vintages. The article examined vintages from different wine regions around the globe. However, at the end of the article she took a dig at many of us by writing that vintage doesn't matter for grocery store wine - so for those who purchase these wines, disregard the entire article. Maybe we are being overly sensitive, but from our many travels talking to wine drinkers, "grocery" store wines are what most people can afford on a daily basis. Including us; our price range is from $10-$15 for everyday table wine. And there are excellent wines in this price range - and from our experience vintages do matter for these wines. We've seen yearly differences between lower priced Virginia Cabernet Franc, Missouri Norton, Texas Lenoir, or a Washington\Finger Lakes Riesling - say Chateau Ste. Michelle among others. She also takes the easy explanation and blames drought conditions on global warming when in fact the earth has cooled dramatically over the past eight years. Even if there were global warming - many scientists predict that that phenomenon would produce more rain because of increased evaporation. Instead, cooler conditions are more likely to produce drought conditions. At least that's what our meteorology guru Joe Bastardi writes. Another benefit that we found while attending FloydFest is that Villa Appalaccia Winery is located right next door, literally a five minute walk. On Sunday, we set aside enough free time to visit the winery and discovered that it is only one of only two wineries in Virginia to produce wine from predominately Italian varieties. One of the reasons is that their vineyard is planted in shale – not the good ole Virginia clay. The shale soil is closer to its equivalent in Italy – so the Italian varietal wines are closer to an Italian wine, than a Virginia wine. We also learned that this is a small winery - producing only 3,000 cases a year. To put in perspective – neighboring Chateau Morrisette produces 60,000 cases a year. The tasting room for Villa Appalaccia is located in a Tuscany inspired country house with a Bocce court on the premises. There is a large covered veranda available for drinking a bottle with cheese and bread – and in our case – to listen to the music emanating next door. Besides the Cabernet Franc, the wines were truly Italian: Pinot Grigio, Sangiovese, Primitivo, Aglianico, and even Corvina. We started with their Pinot Grigio and Pinot Grigio Reserve; the later is the standard Pinot Grigio where ½ the wine is fermented in steel then in the barrel. Normally we prefer other white wines, but both of these were very drinkable and refreshing – with a surprisingly fuller flavor than most versions we have sampled. We next tried the Simpatico, which was our favorite white and the one we consumed at FloydFest. It is a blend of Trebbiano, Malvasia Bianca, and Pinot Grigio that has citrus flavors and a spicy finish similar to a Gewurztraminer. At $15, this is an excellent everyday white wine. Moving to reds, we sampled several wines that are produced no where else on the east coast. And if the winery produces the now sold out Rustico (made from the Corvino grape) in the future then the experience will be even more enlightening. We started with the Primitive – the Italian Zinfandel - which has a strong cherry aroma and smooth flavor. Although a little spicy at the tail, the wine is a toned down version from those produced in Lodi or Amador. Which translates to “very drinkable”. The Toscanello was next and this blend of Cabernet Franc, Sangiovese, and Primitivo is a medium bodied wine – smooth and drinkable now. The wine is aged in old French oak, with a small amount in 1-2 year old American oak. Our favorite red was the Aglianco – maybe the only 100% Aglianco wine made in the United States. This is a full bodied wine and Villa Appalaccia recommends drinking with “substantial” meats. The final red was the 2004 Cabernet Franc – one of the many excellent versions produced in Virginia. It has a huge cherry flavor – smooth with a low tannic finish. It was plainly evident that the red wines were the strength of this winery. There were also two dessert wines, the Alba and Raspberry Beret. The Alba was very interesting because this year’s version – made from Vidal Blanc and Moscato – contains a strong minty aroma that disappears with the taste. Very interesting.... The Beret is for chocolate lovers – it blends seamlessly with a morsel. And we like anything made from raspberries. 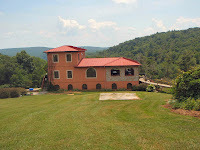 We highly recommend a visit to Villa Appalaccia either as a planned trip, while attending FloydFest, or simply while driving the Blue Ridge Parkway. Otherwise you have to attend one of the many Virginia wine festivals – which account for almost 30% of all their wine sales. We look forward to next year’s festival – and a longer stay at the winery. The FloydFest organizers selected the Château Morrisette festival parking lot as the general parking area for their festival. This made it rather easy to visit the winery during the event and we had arranged to meet one of the festival’s performers, Oneside, at the winery. The Château Morrisette’s birth occurred in 1978 when the Morrisette family planted the first grapes in the estate. It turned out to be another "hobby that grew out of hand" as the winery’s production and yields increased. Son, David Morrisette received a degree in enology and viticulture from Mississippi State University and returned home to become the winery’s first official wine maker in 1982. For the rest of the decade the winery’s production and variety of grapes increased and a new change ensued when the Morrisette family invited David’s former classmate Bob Burgin to become the primary wine maker. The wines continued to improve under Burgin, but eventually sales started turning flat. The solution: a change in marketing. The labels of several wines were changed to the “Dog” series in honor of the vineyard dogs and the family’s support for canine charities. Sales soared so the existing production facilities were expanded so that the winery now has capacity to age 130,000 gallons in stainless steel and 50,000 more gallons in oak. The source of grapes has also expanded to 150 acres of vineyards spread out across the commonwealth. Over the years Burgin transitioned to other responsibilities so the winery hired Dan Tallman, the former winemaker of Clos Du Bois Winery, as the head wine maker. 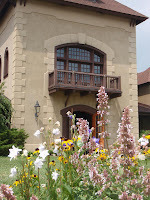 With the large Chateau, weddings, music events, and good wine – the winery is a popular destination. When we arrived, there were already a few visitors from FloydFest, a wedding was being organized for later that afternoon, and the area Kennel club was holding a meeting. Even with this large contingent of visitors, there was ample space for everyone and we headed to the tasting bar. Regrettably we did not get a chance to sample their Tannat or Petit Verdot, but for a $5 tasting fee, we sampled ten wines. That’s a bargain in itself. We started out with what turned out to be our favorite white, the 2006 Viognier. Made dry, this wine still had a fruity aroma and flavor. A lighter wine, the Independence, was next in the queue. This Traminette and Riesling blend had a grapefruit flavor and a spicy finish from the Traminette. Not bad. Our first red was the Liberty, a medium bodied wine made from Chambourcin, Cabernet Franc, and Petit Verdot. This was a very good everyday drinking wine, priced at $12. It’s full of black cherry flavors and a smooth finish. The 2006 vintage Chambourcin was next and this wine had a peppery finish – probably from aging in French Oak. I preferred this red to the 2005 Merlot, which just wasn’t full enough for our tastes. Getting a little sweeter – and spicier, we tried the semi-dry The Black Dog, a blend of Cabernet Sauvignon, Chambourcin, and Merlot. This is a very smooth wine and is the same formula as the Hokey Red. The Hokey White is based on the Angel Chardonnay, which we liked; the chardonnay grapes were either barrel or tank fermented and then a little Riesling and Vidal Blanc added to the concoction. Pineapple is prevalent in the nose and flavor. The winery’s most popular brand, Our Dog Blue, is a semi-sweet blend of Riesling, Vidal Blanc, and Traminette. We carry cases of wines to friends on our travels so are well aware of its popularity. A good picnic wine – and affordable at $10. The sweet American blend of Concord and Niagara was also a favorite – the winery markets it as a dessert wine – but looking around people were commenting as if it were a table wine. It’s fruity and grapey – the distinctive concord flavor prevalent. The final wine was the 2005 Frosty Dog, an ice wine styled wine made from frozen Traminette and Vidal Blanc grapes. This wine has a great honeysuckle aroma and a semi-honey flavor. At this time, Oneside joined us and we headed outside with a bottle of Viognier. Front man Ned deBray had worked at a wine shop in his past and was well aware of the grape’s Rhone heritage. He had already selected the vintage Petit Verdot as a gift, without knowing how well the grape grows in Virginia. The band was in awe of the surrounding countryside and estate and we enjoyed the wine having a nice conversation. As one of Virginia’s largest wineries, they don’t need our help in convincing people to visit. There wines are also prevalent in local wine stores so you don’t need to travel the Blue Ridge Parkway to taste the wines. We will see them again at next year’s FloydFest.